The Culture Keeper Award was established in 2002 and presented during the Institute's Second Annual Conference. This award is given to organizations and/or individuals who have been instrumental in preserving the cultural and historical capital of the African American community. Previous recipients have included: Eva Noles, the Afro-American Historical Association of the Niagara Frontier, Inc., Jesse and Hortense Nash, about.time Magazine, the Buffalo Criterion, the Buffalo Challenger, Eddie Faye Gates, and Dr. Juanita Pitts, M.D. 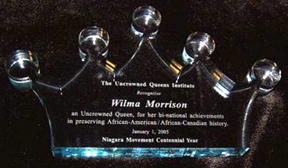 Lillion Batchelor, founder of the Buffalo Historical Quarters Society and Wilma Morrison, who established the Norval Johnson Heritage Library and re-established the Niagara's Freedom Trail Tours are the 2005 Culture Keeper Awardees. These two very special women have, individually and collectively, reached across the United States/Canadian borders ensuring that the Underground Railroad and its international connections would vividly maintain its place in local history. Uncrowned Queens continues to explore these regional legacies that provide the rich historical underpinning for further study of the region.